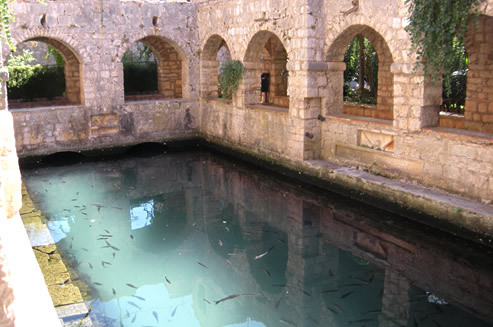 Tvrdalj in Stari Grad is a fine example of a fortified summer residence, best known for its fish pond in the courtyard. Wikipedia lists Tvrdalj as a castle – but that seems a rather grand description to me. Looking at the collection of buildings around the fishpond, and the lovely walled gardens, all set in the midst of town I could not see how on earth this could be defended against anyone! But wait, this is not what the poet & house designer Petar Hektorovic planned for himself back in the 16th century. 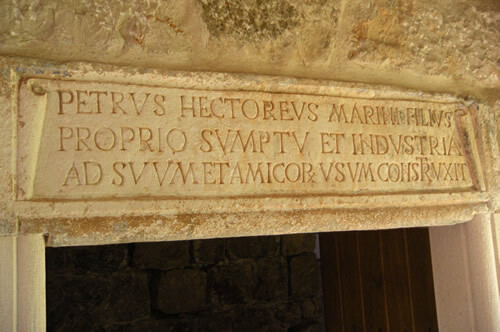 Following an invasion by the Turks in 1539, he set out to make his summer retreat more secure. It’s true that the Turks still managed to trash the place for a second time in 1571, but Tvrdalj was in fact pretty well fortified. 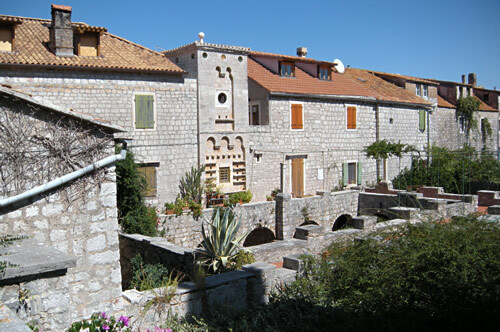 The interior courtyard of Tvrdalj, with the arcade round the fishpond and dovecot tower above. Original housing was single story. For a start, the north face of the building was directly on the waterfront, and the main entry was by boat. A high wall surrounded ALL the buildings – not just on the north side. And that collection of houses? Most are later additions – originally it was all single story, except for the tower with the dovecot. Parts of the fortified structure have long been dismantled, presumably not required or in too dangerous a condition. One important part now missing is the ravelin – part of a defensive structure that juts out, allowing you to catch the attackers from above. The front prow of St Mary’s church in Vrboska is a fine example of a ravelin built at about the same time. There’s actually a bit of controversy going on at the moment as one of the two buildings on the north side (see photo above) on either side of the tower has recently been extended up so is higher than the other. It gives a lop-sided appearance to the facade and there’s strong opinions as to whether this should be allowed to happen in such an important historical building. But, frankly, neither house was part of the 16th century “castle”. When we were looking for property on the island, we toured the house on the south/east side. I’d have loved to be part of such a place, but we were advised that getting planning permission to do anything to the outside was a tortuous and very slow process. I guess the door had been firmly closed and bolted by then! Fortified or not, Tvrdalj is a lovely place to visit. 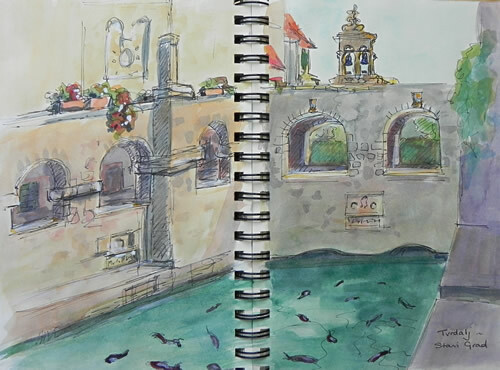 The peaceful arcade around the fishpond is shady, and the rectangular seawater pool is full of grey mullet. Hektorovic’s walled garden of medicinal plants is pretty sizeable, though partly used as allotments in recent years. 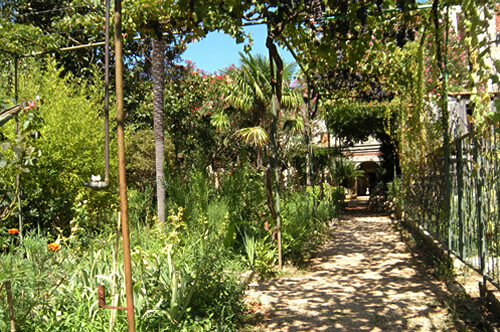 Near the houses there are shady walkways to stroll around and enjoy the flowers and vines.Beautiful on a sunny day! 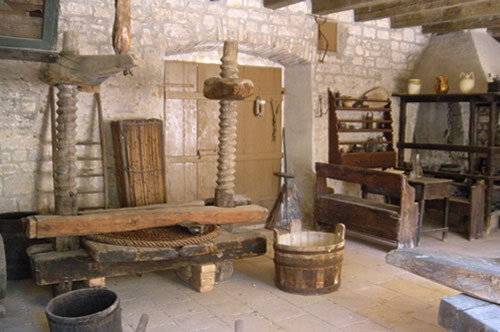 Part of the complex houses a small display of old Dalmatian household effects and kitchen equipment, including a massive press. Display of Dalmation household equipment with goatskins, olive press and other useful stuff! This must have been a beautiful summer retreat and it still has that feel. This was never a grand ornamental palace filled with Greek and Roman statues, though I’m sure there were plenty of those to be found locally. This was a rustic retreat, built by local craftsmen for a simple back to nature lifestyle. It seems more related to the ancient Roman villae rusticae than to the grand Venetian style palaces being built in Hvar town at the time. As a final thought, the name Tvrdalj (meaning fortress) actually pre-dates Hektorovic’s summer palace. When the family acquired the property in 1448, it was already known by that name, due to an earlier fortification on the site. Also nearby was a Roman villa with a bath house. Was that where the idea for the pool came from, and perhaps some of its construction? I find it fascinating that we might actually be looking at a recycled Roman bathing pool here!